Once Holy Realm is Insanely fast, harsh black death metal. A brutal satanic force that lashes out with a bit of old-school thrown in for a few extra broken bones. Cryptic has different style but the general features are similar. 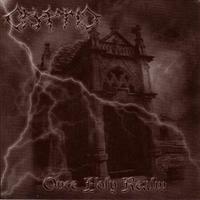 “Once Holy Realm” has very dark and hellish mood. Cryptic knows very well how to create such atmosphere. That’s a rare ability. Such atmospheric materials were more typical for the scene from the late 80’s and early 90’s. Necrotion, Vital Remains, Astaroth, Crucifier – those bands were recording brilliant demos in such vein.